I had one of those sleeps that are so deep, you don’t realize how long you’ve been out. It felt as though I had just closed my eyes before the alarm went off. Note to self: I have find a bed like that. As I was leaving, I told Christine where we headed and asked about a good breakfast spot. She suggested Whifs Flap Jack House and so after loading the dogs into the car, we made our way east for breakfast. We did make one small stop before we got there. 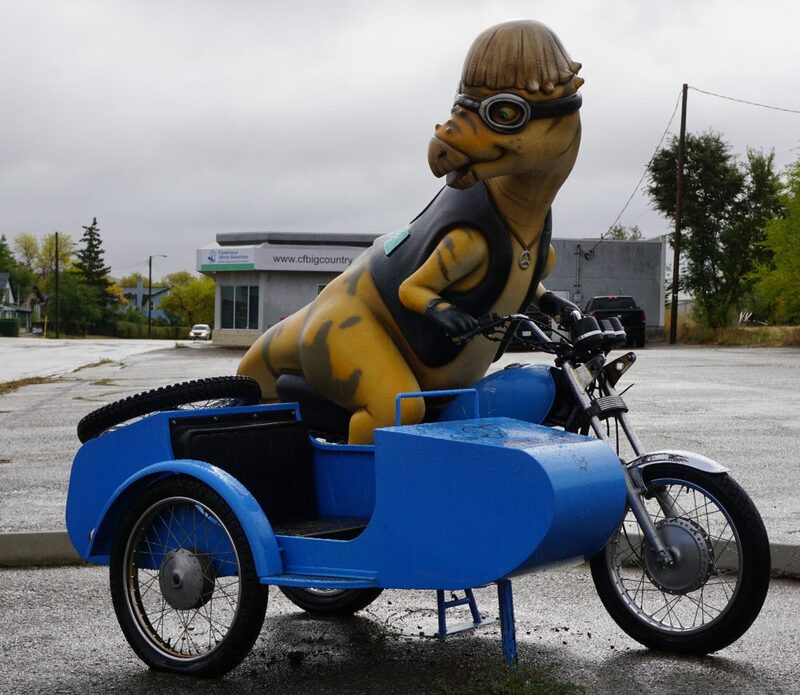 You see, Whifs is in Drumheller Alberta which is famous for it’s deposits of dinosaur fossils. How could I be driving by and not stop? That just wasn’t going to happen. 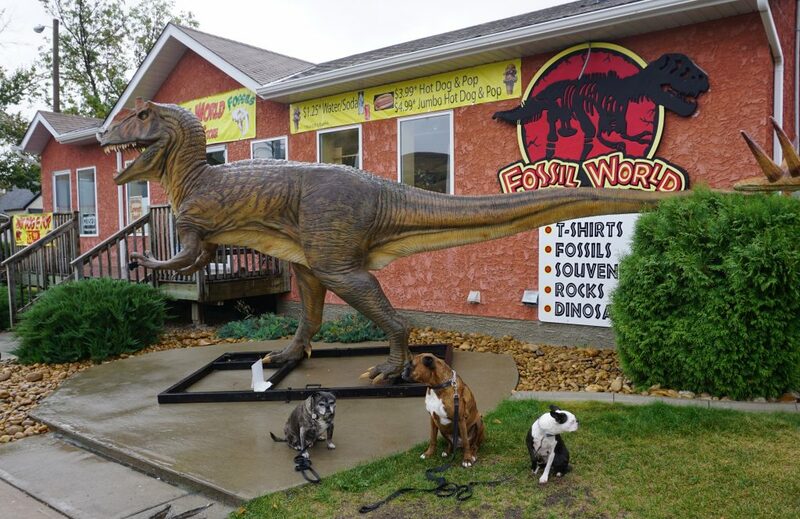 I could not pass up the chance to get photos of the dogs with what I’m assuming is a tyranosaurus rex as we drove into town. 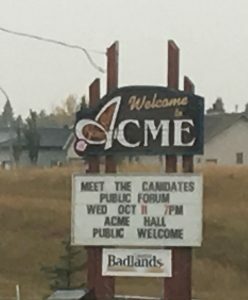 Not to mention a town called Acme. We didn’t explore but I did get a photo of the town sign. Taking a sniff around a picnic area that also explains the significance of mining in the area. I ordered a breakfast of pancakes, bacon, eggs, and whole wheat toast with a cup of coffee. Unfortunately I had forgotten to specify “to go” so when the plate arrived in front of me, I figured I would just inhale it rather than fuss with a container. 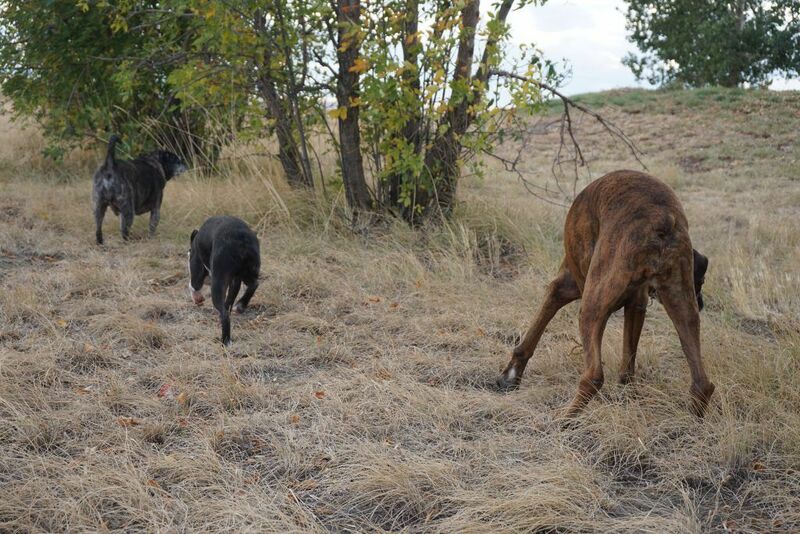 I put aside a few pieces of bacon for the dogs to make up for leaving them in the car and got to work on breakfast. It was your typical diner breakfast that gets served up everywhere. The coffee was decent enough. The coolest part was the train that followed a track than ran around the top of the room. 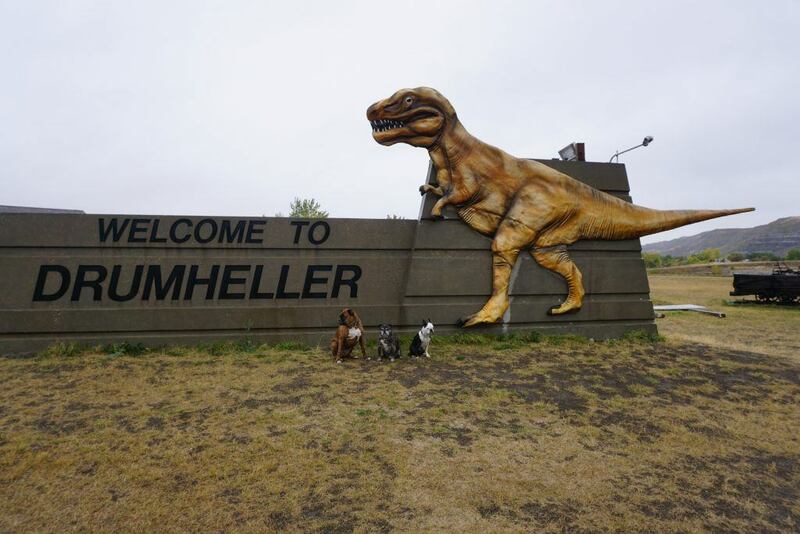 I returned to the car and we drove to the Drumheller Visitor Centre, passing brightly painted statues of dinosaurs on the side of the streets. Had it not been raining and I didn’t have an delicate dog, I would have parked the car and tried to find every single statue. 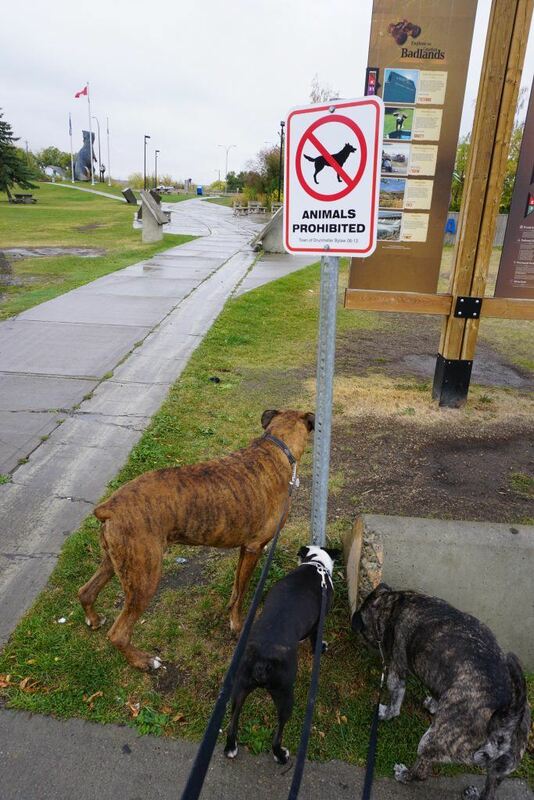 When we arrived at the visitor centre, I was dismayed to see a sign that dogs were not allowed in the park there. Jack was also not happy with this and I tried to get a photo of him peeing on the sign. Then I looked across the street and saw some other large statues so we went there for some photos. 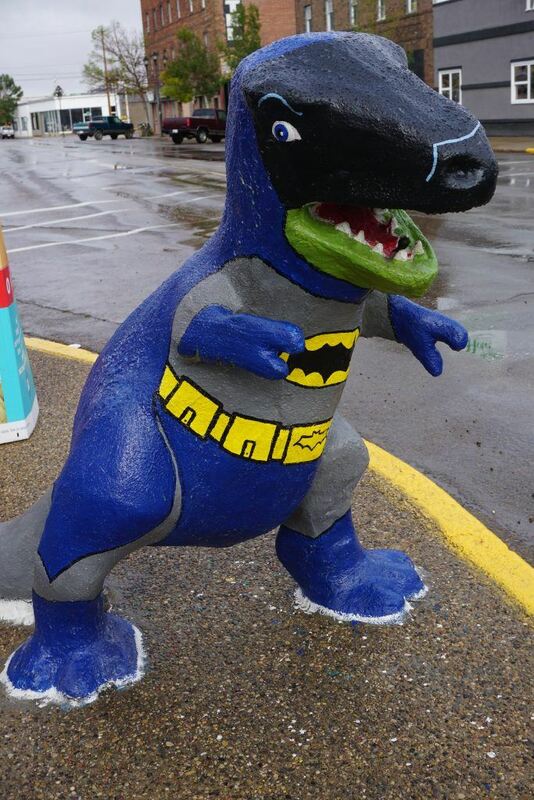 And completely indifferent about the velociraptor. With the dogs back in the car, we started out of town, stopping for a couple of photos that I just could not pass up. 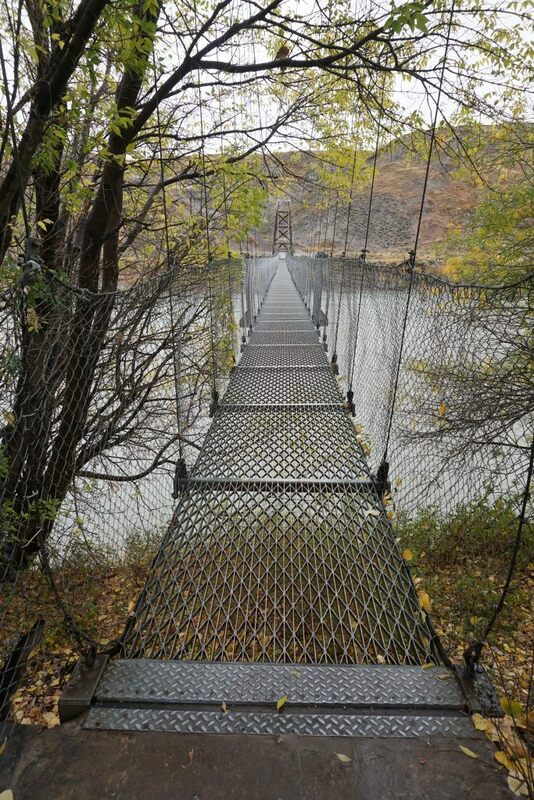 Then I saw signs for a suspension bridge and decided to investigate. As soon as I saw it, I knew that we would not be able to cross as the metal flooring of the bridge would not have been kind to little dog paws. So we continued on. It was hard not to drive around town finding all of these. We drove until I saw signs for the Hoodoo Trail. I wasn’t quite sure what a Hoodoo was but there is only one way to change that. 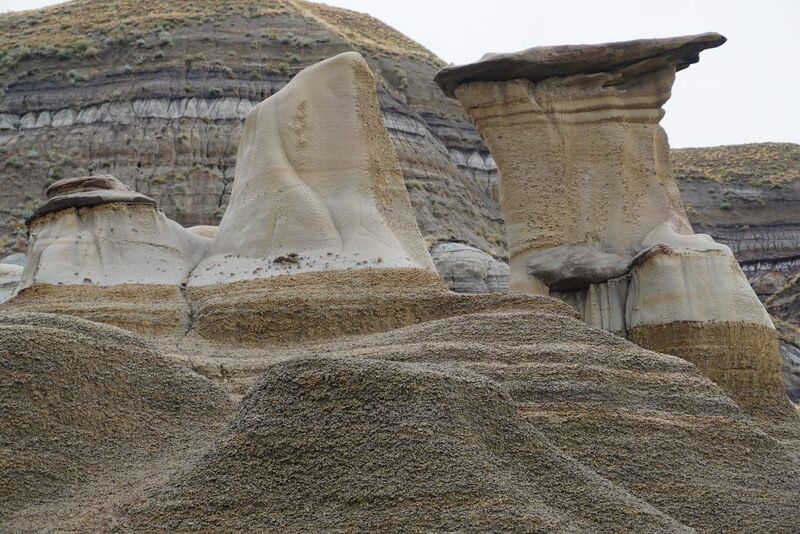 These formations were created as the sandstone pillars eroded out of the badlands leaving a rock cap. They are fenced off and a metal grate walkway and stairs leads around the formation. I dropped the ball a little on this one: I looked at the grates and thought that it wouldn’t bother the dog’s feet and that the grates ended at the top of the stairs. Well the grates continued around the entire site and while Piper’s larger feet were able to handle the grates, Jack and Leo’s smaller feet did not do so well. I had initially thought that they didn’t want to go up the stairs since they they could see through them. It wasn’t until we got to the top that I realized that they weren’t afraid, they were uncomfortable. So I scooped Leo up and coaxed Jack back down. We still walked around the one side of the formation and then climbed back into the car. Don’t know who these folks are but I thought it was a good photo. 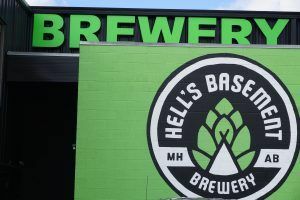 We continued east and then as we drove through Medicine Hat, my attention was grabbed when I saw a sign for two breweries. 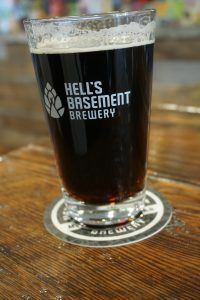 Since I couldn’t visit both, I picked the closest that just happened to be called Hell’s Basement. 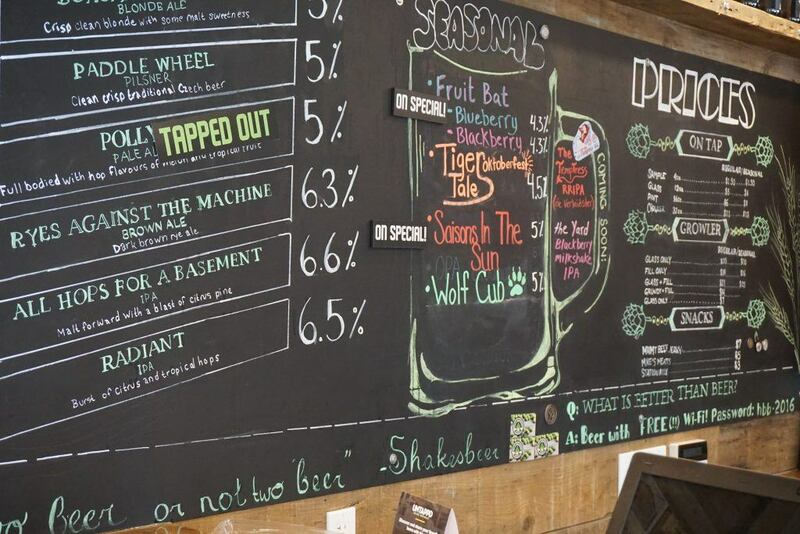 This brewery was dog friendly and did offer samples and I happily tried a few before settling down with a small glass of the Ryes Against the Machine. What can I say: I’m a sucker for a good name. 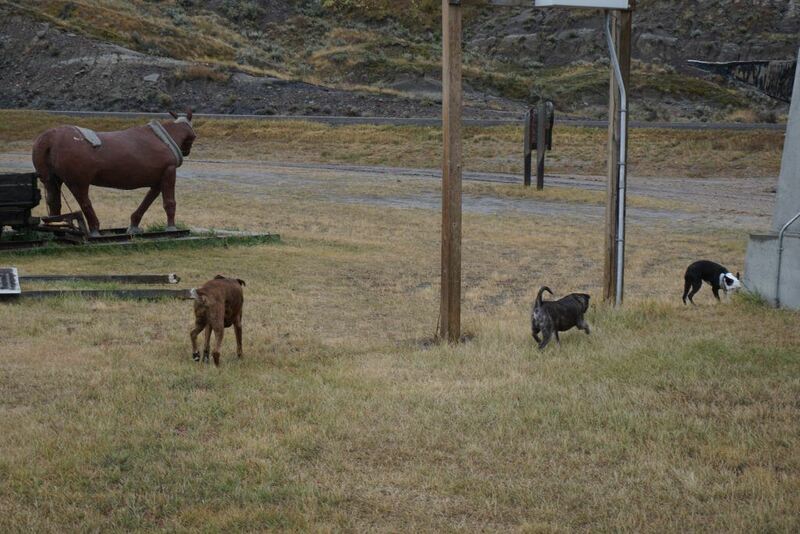 The dogs took on the job of guest greeters and no one got within sniff range without, well getting a sniff. I snagged a few cans to take with me, and we continued eastward. 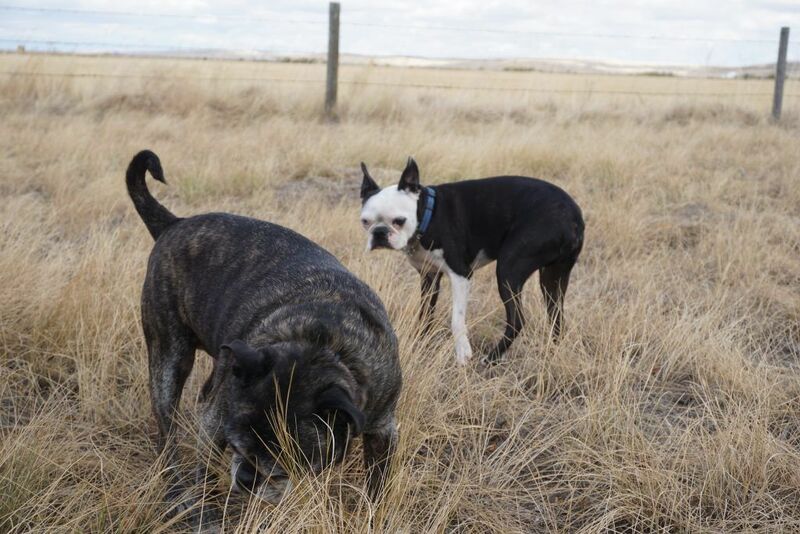 We kept driving east, pausing at the border between Alberta and Saskatchewan so the dogs could explore the tall grass. 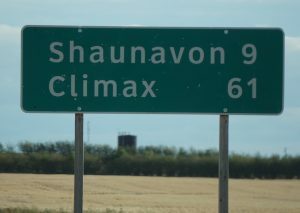 I was following the road when I saw another interesting sign for a town: Climax. Not quite sure about that one and I was oh so tempted to go and find out but our destination was more important than my raging (hehe) curiosity. 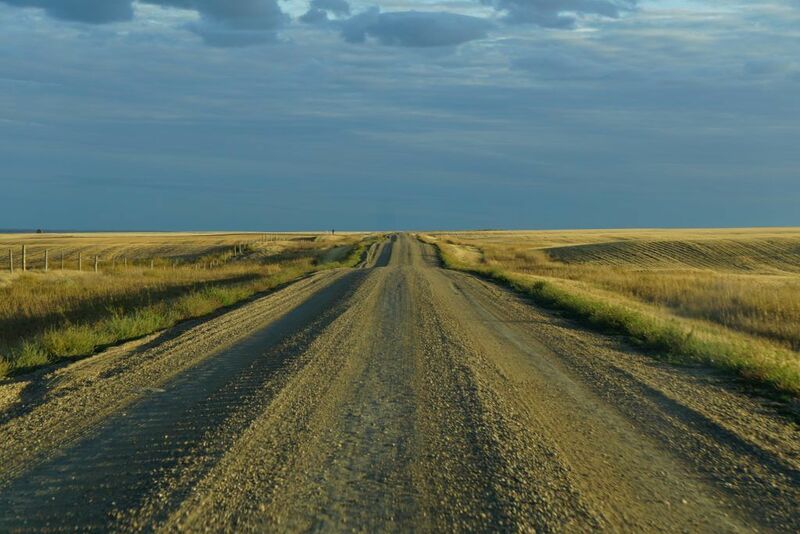 The remote prairie around us provided some stunning scenery as we left towns and cities behind. 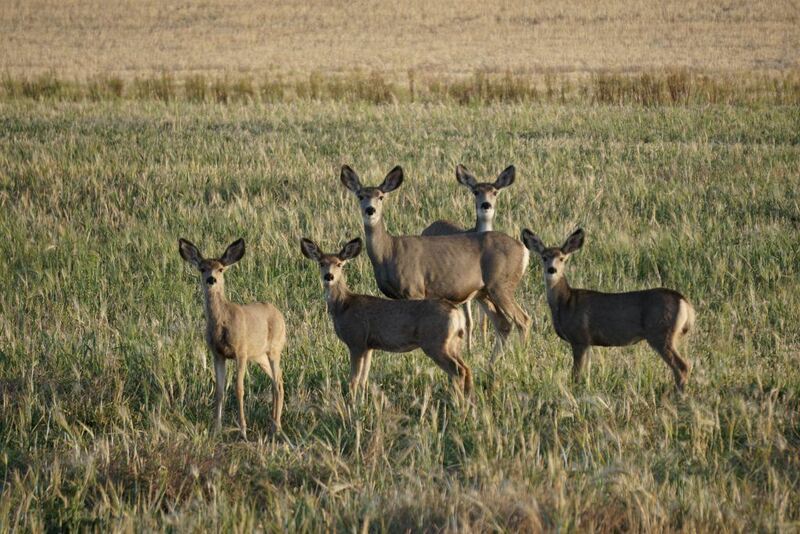 We had a short visit with some of the locals. The prairies are dotted with all kinds of abandoned buildings. The boys wanted to follow the trail. I really like this photo. 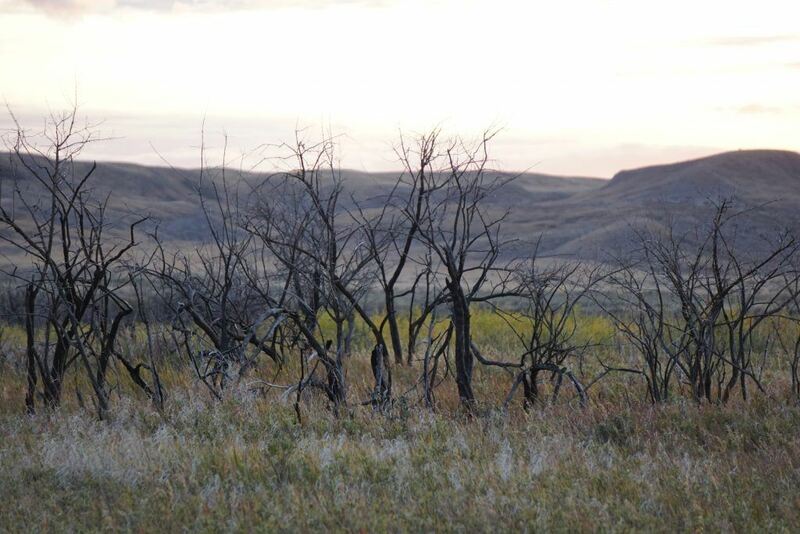 It was getting late when we drove into Grasslands National Park. The park is comprised of two blocks: the West Block has the Ecotour Road that goes through a large section and the East Block that is smaller and has less road access. There are no direct roads that lead between the two sections. Given that I had gotten there a little later than I had planned, which had everything to do with traffic and nothing to do with a detour to a brewery (ahem), I decided to go to the larger West Block. Now I’ll be the first one to say that I was not expecting much from Grasslands. 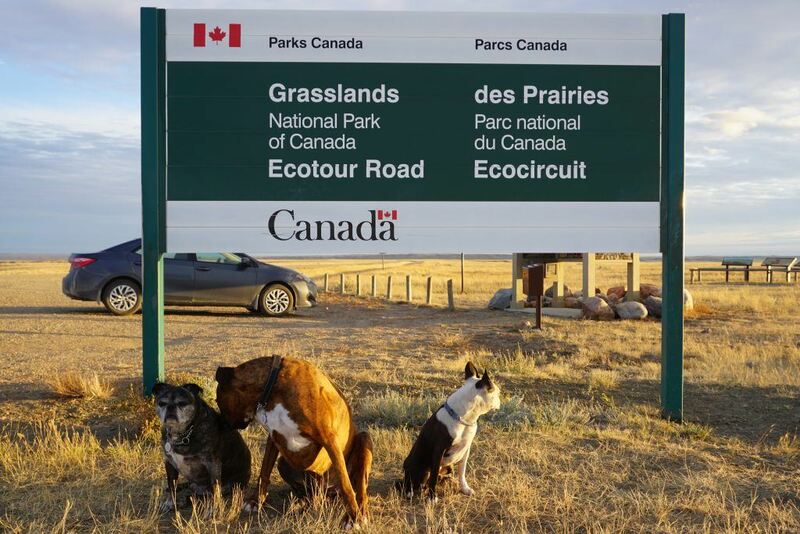 I mean, it’s prairies. Flat and grassy. The old “I saw my dog running away for three days” kind of flat. Well get that right out of your head. This place blew me away from the minute I got there. Sure there aren’t mountains or raging rivers or stunning lakes, but I could barely drive more than five minutes without seeing some form of wildlife, it wasn’t crammed full of people, and there’s a certain freedom that comes from a beckoning horizon. Had my travelling companions been sound, we likely would have parked the car and answered the call of that distant horizon. There are no trails so you could park the car and just walk. 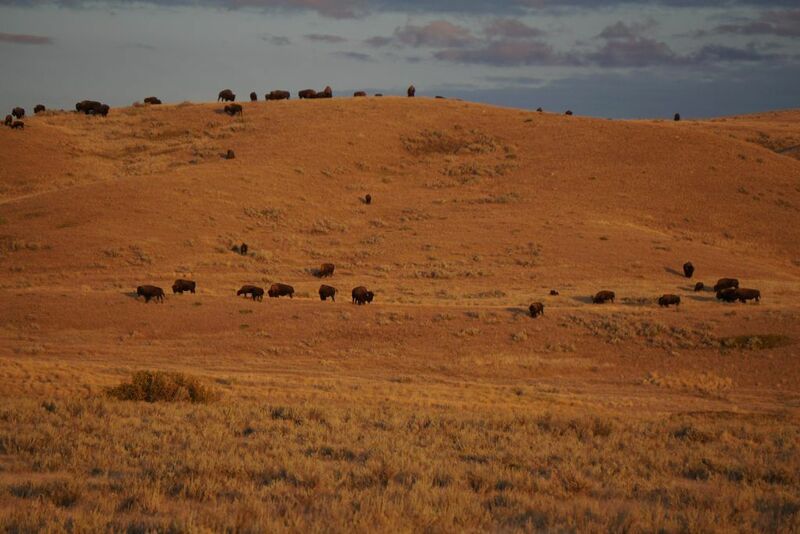 We stayed safe in the car as we watched the herds of bison that dotted the landscape. While they were not quite as massive as the woodland buffalo that we had seen in the Northwest Territories, they were still impressive and I was overwhelmed by the sheer numbers of them. 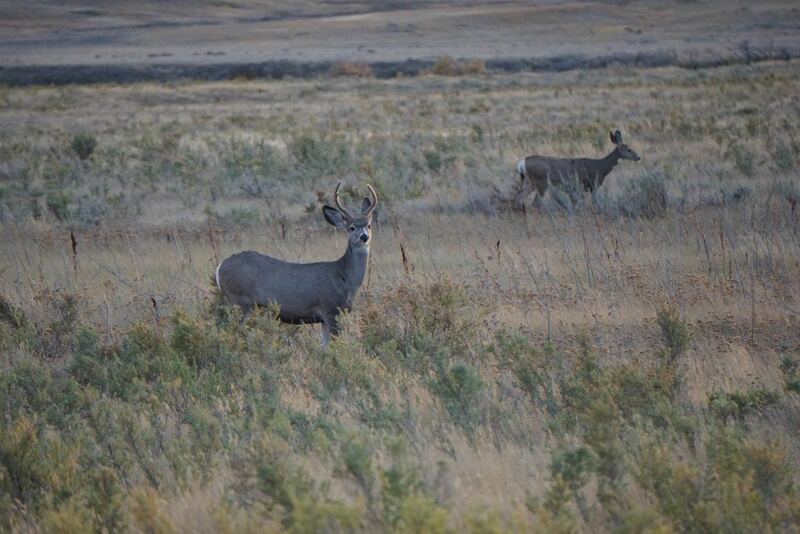 We also saw what I think are mule deer, grouse, and sizeable areas dotted with prairie dog towns. The hills were dotted with bison. 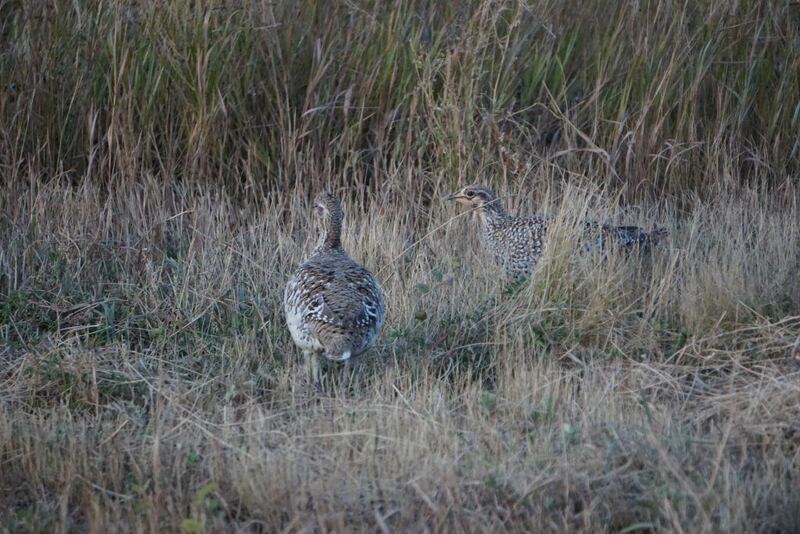 These were next to the road and had no fear of the car. The sun was going down and I had to figure out our sleeping arrangements. It was going to be cool but dry. With no accommodations available in the immediate area, it was going to be another night of camping. I was worried as there was only one campground but there was plenty of space for us. We found a spot next to a tall berm that would help to deflect some of the prairie wind and I quickly set up camp. It was the only time on this trip that I felt the need to use the footprint for my tent as the thick stalks of some of the plants seemed that they would be more than capable of puncturing the floor of my tent. The dogs picked at their food and kept trying to sneak into the tent as I was setting it up and in short order, everyone was bundled up inside. We went to sleep listening to the sound of coyotes howling with the wind. The Ecotour Road loops between Highway 4 and Highway 18 near the town of Val Marie for the West Block. To access the East Block, take one of the gravel roads that connect to Highway 18. Hiking and horseback riding are the best way to see the park. 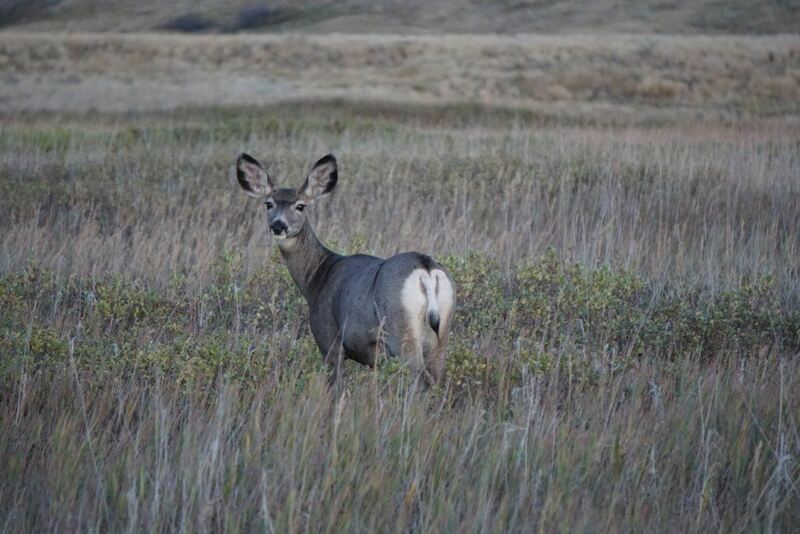 This gives you ample opportunities to view the wildlife that roam the park. There is one front country campground in each block that offers serviced and unserviced sites. 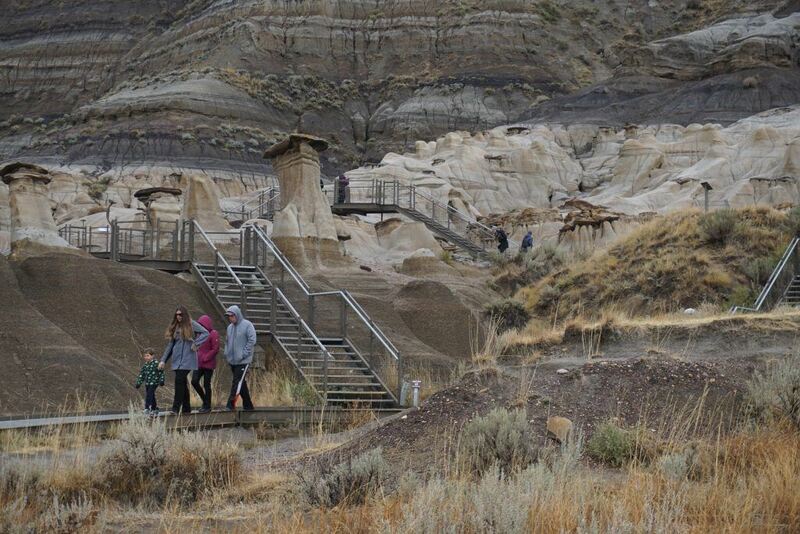 Frenchman Valley Campground in the West Block also has oTENTik sites. There aren’t any designated backcountry sites which mean you only have to make your way a minimum of 1 km from the road and set up your tent. The only potable water in the park is at one of the campgrounds so if you plan on backpacking, make sure you bring plenty of water with you. There are places to eat in Val Marie but I haven’t tried any of the restaurants. 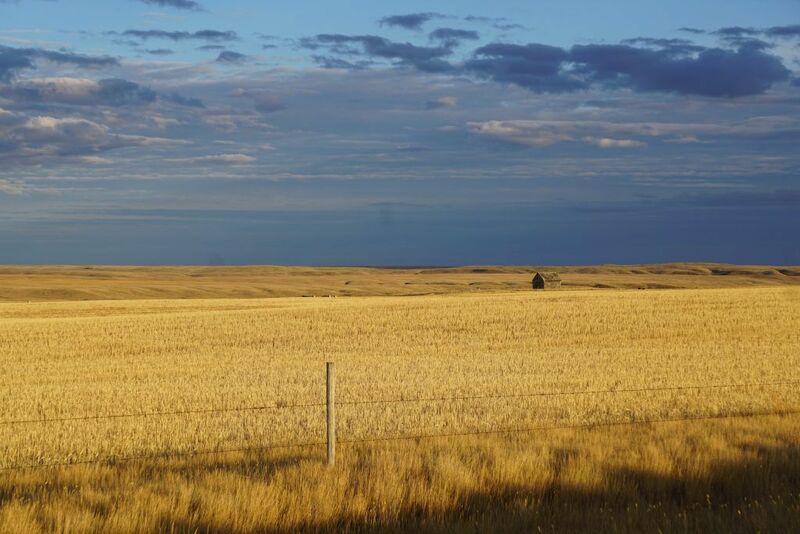 6 response to "Dinosaurs, Bison, and the Never-ending Prairie"
I am a HUGE fan of prairies. 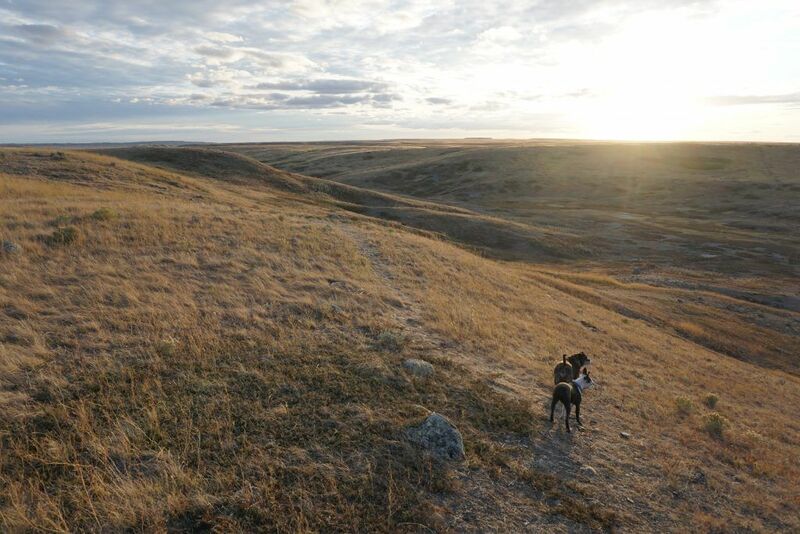 Oh sure, mountains are splendid and gorgeous in their own right, but prairie grasslands hold some kind of magical hold over me. The vastness of wind swept vests and open skies are just too intriguing. 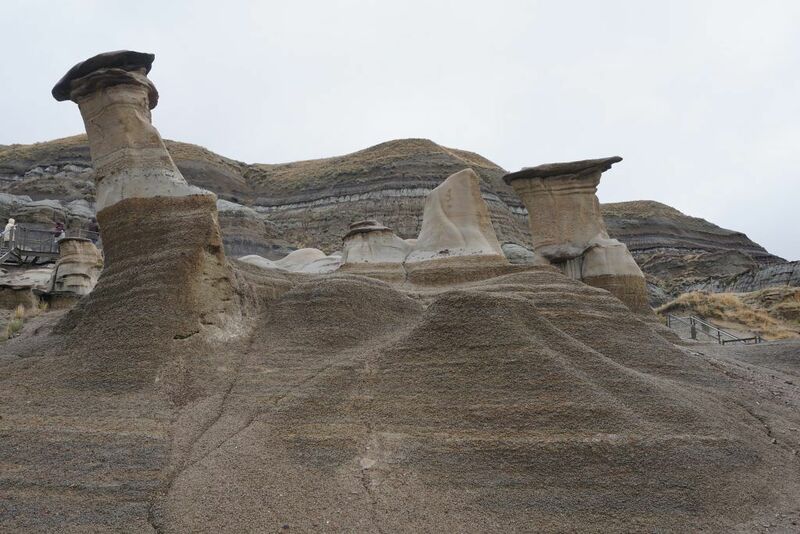 The hoodoos are incredible! You totally nailed it. I used to think the prairies were blah but that was because I was always in the cities. They are truly captivating. 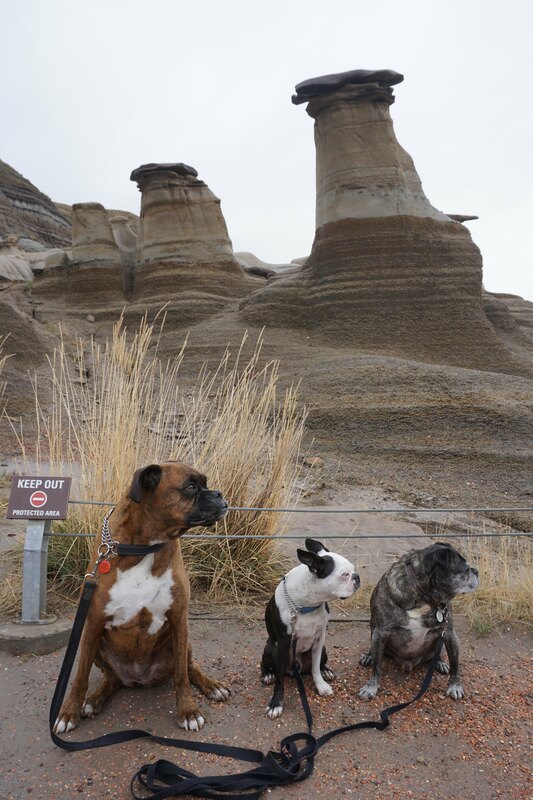 I’m glad they have the hoodoos fenced off so they’ll last forever but I’ll admit I wanted to get lost among them. Beautiful pics! 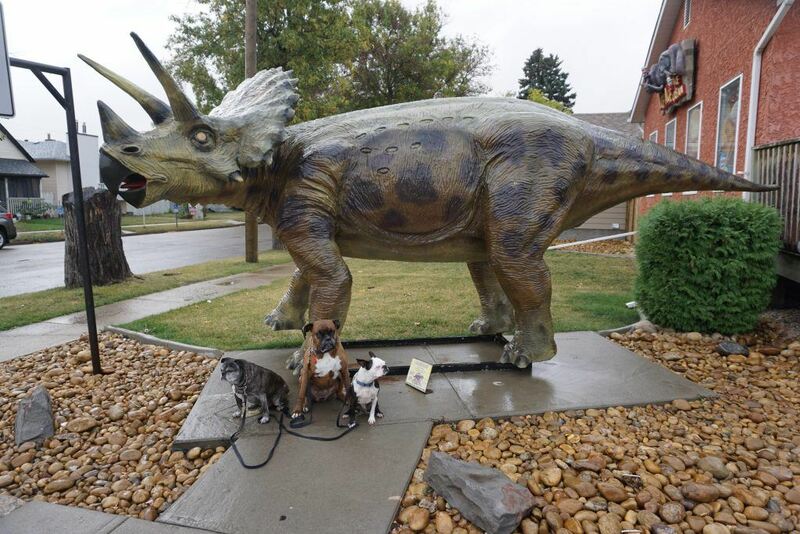 Love the doggos posing with their dino friends! Thank you. I couldn’t resist getting those photos.